The Stockholm Card - a discount card filled with free sightseeing and attractions in Stockholm, Sweden. The Stockholm Card has been discontinued Dec 31, 2015. 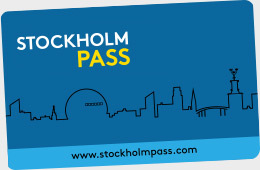 Stockholms new discount card is called the Stockholm Pass! There has been some changes in the new Stockholm Pass content. The pass is valid for 1, 2, 3 or 5 days. Free local transport on buses and subway is not included any longer. NEW! Free unlimited travel on hop-on/hop-off buses and boats that makes travel around Stockholm easy. You can also add a travel card to the Stockholm Pass. Kaknästornet is not included any longer. Otherwise the Stockholm Pass is much similar to the former Stockholm Card. All of Stockholm in one card. The Stockholm Card is ideal for those who want to discover Stockholm's museums and attractions at a discounted price. With the card, you also get free travel on Stockholm's public transport such as buses, trams and metro. And not only that you also get free sightseeing by boat around Djurgården and various bonuses. 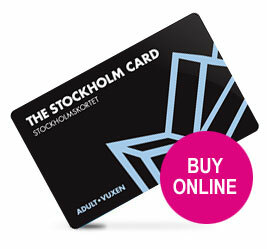 Buy the Stockholm Card for 2, 3 or 5 days. The Card is avaliable for both adults and children. The Stockholm Card has been discontinued on Dec 31, 2015. We will soon be back with more information about a new Stockholm discount card. You buy one card per person. Adult and children (6-17 years). Children under 6 years are free to go with an adult who has the Stockholm Card. A Child card (6-17 years) can only be used together with an Adult card. The card is activated the first time it is used. It is then noted the date and time. Ex. if you purchase a 2-day card and activate it at 14:00 it is valid until 14:00 the second day. When you buy a multi-day card the card is valid the number of days you bought in consecutive days. The Stockholm card is valid only once per attraction. After buying the Stockholm Card you will get a confirmation to your email address. Bring this confirmation with you to collect your card. You can collect your Stockholm Card at the Stockholm Visitor Center, Sergels Torg 3. Stockholm's most visited attraction. In 333 years the warship Vasa was hidden on the ocean bottom. Now she stands above the surface for you to view..
Visit the beautiful Swedish Royal Palace. It is one of the worlds largest castles. View the apartments, the Banquet Hall and the Representation floors and much more. Free boat sightseeing around the island of Djurgården. Experience the beautiful historic buildings and beautiful scenery. For the photo enthusiasts. Potografiska is the largest space for contemporary photography. Nice view from the bar on the top floor. Stockholm's famous amusement park. Amuse yourself during a day and go on the roller-coasters. Fun for both kids and adults. Ride in a gondola up the Globe's wall (about 100 meters). A tour that takes you up to the top with a fantastic view over Stockholm. Stockholm television and radio tower. Get a fantastic view of Stockholm from the 30th floor. The tower has a café. Here the Swedish regalia is kept. See treasures like Gustav Vasa's sword of state, the orb, scepter and several beautiful crowns. Experience how Sweden was before. Visit houses, farms, animals, churches and people. Fun for both adults and children. The Viator website gives you more information about what is included in the Stockholm Card. Be aware that some attractions and sightseeing can be seasonal and have modified hours during the holidays. Please check the opening hours of each attraction's website. On some sites / attractions it can be changed entry fees on certain days and then the difference may need to be paid. In some places, you should show your card to obtain a ticket. With reservation to any error in writing or changes in content and prices.